- Improve people’s life through meaningful solutions. - Create brand loyalty through significance & consistency of products/ services. - Challenge subject matter and current trends’ landscape. 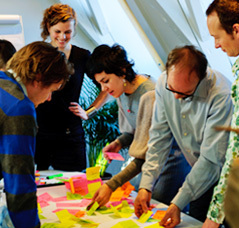 - Co-create with respondents and clients. - Immerse in contexts of trends, markets and consumers. - Entice through communication and applicability of findings. - Inspire and provoke clients. - Be an empowering eye opener through findings provided. - Design preferred and innovative futures for brands.